I am late getting to this. In recent days I've appreciated the work of others, notably David Apatoff, in celebrating the life of Bernie Fuchs, a paradoxically famous but unknown illustrator whose work in the 1960s and 70s established a look characterized by light touch and grace. (I say famous but unknown because those in the field knew him as a major figure, but the shrinkage and slippage of periodical illustration after 1950 cost him a broader public following of the sort enjoyed by major illustrators from the first half of the century.) Mr. Fuchs died late last week. Today's New York Times runs an obituary by Steven Heller. 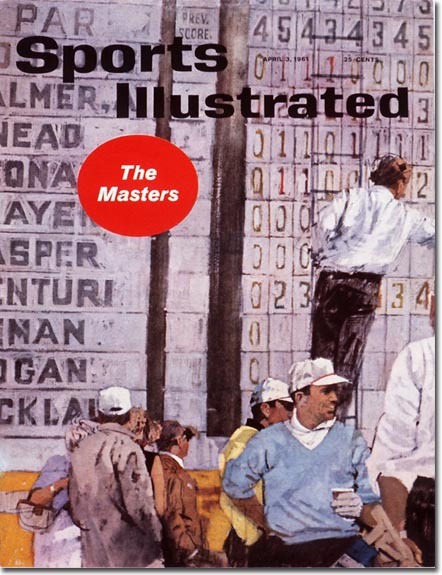 I remember Bernie Fuchs' work in Sports Illustrated from my youth. I didn't really get a fix on the person or the profession; I just looked at the pictures and thought they were cool. Fuchs did a lot of golf work for SI, as his investment in light and gift for pacing (inside a single image!) made him a natural. His work will always make me think of my Dad, a serious golfer at the height of his powers when Bernie was, too. On a different sort of personal note, I am eager to celebrate Bernie's achievement as a favorite son of Washington University in St. Louis, where I teach. I had the pleasure of meeting Bernie and his wife Babe when they came to campus in 2001 for the Al Parker symposium. My wife Lori interviewed Bernie at the time. I have rummaged around and found a transcript of that interview, which includes a wonderful anecdote about Bernie meeting Al, who had been a hero of his. I will post snatches of that transcript this weekend when I have some time. I raise my glass to Bernie Fuchs. I see him strolling up a light-soaked fairway toward the last green, smiling.